"... but usage is still well short of expectations, records obtained by Bridge Magazine show." Yep, that pretty much sums up why they want to shift the tab to the people who don't ride it. What??? Not making projections? Mass trans vomiting red ink? This must be a shock for Ned Staebler in next commentary that so many public enterprises fail. It's great that he is placed right after this report. It gets a bad rap most of the time, but I actually use the QLine quite frequently on weekends and during events. Rather than pay for parking downtown, I park for free in New Center or North End, walk to a QLine stop, buy a pass and head into downtown or midtown. It's also fairly packed whenever I've been riding. I'm not saying it doesn't have its issues (e.g. it should've been built center-running only), but I do ride it a lot more than I thought I would. I think as residential and business population grows along the Woodward corridor, as well as more events/conferences/conventions land in Detroit, ridership will eventually reach operators' expectations. Also, despite its problems, average daily ridership increased by 10% in a single year (2017-2018). That is pretty impressive for any type of transit service in Metro Detroit. This enterprise was oversold from the start. Figures were inflated to win approval for the project, and the numbers will never be realized in the real world. Have you ever seen a project that didn't overstate its goals? Like 'tax cuts always pay for themselves', for example? Cite a project where they met the goals stated BEFORE the project was approved. Ridership should include the hundreds (perhaps thousands?) of Quicken and associated companies employees who park in lots and garages in New Center, a block away from the Q Line stop at Grand Blvd. Instead, there is a fleet of polluting buses that drive them downtown and back. If Gilbert would stop paying for these buses and instead focus on making the Q Line a viable option of his own employees, it might benefit more Detroiters and the Q Line's operation generally. My most recent Q Line trip involved waiting 15 minutes for a car in the lane a block from the station, the PA announcing the incorrect stations, but an officer asking for our tickets as soon as we boarded the car. Perhaps you should compare the ridership on those buses with the streetcar before you try to vilify their existence. I believe the buses being referred to are the private shuttles which are contracted by Quicken and not the SMART or DDOT buses. @WK, I don't have reams of data to support my comment, but I drive behind and past full buses five mornings a week getting on to the Lodge. I have also, on occasion, taken the Q downtown on a weekday morning. In all my observations, there are many more people on the many more buses than there are on the few Q trains. And I'm not trying to vilify the buses, I'm simply saying that it's unnecessarily redundant to pay for buses, when there is a solution right there that is both greener, doesn't add traffic to the roads, and doesn't have an incremental cost. And while we're on the subject of buses, a system of Bus Rapid Transit, rather than the Q Line, would have yielded more effective public transit for more people at a lower cost. All of that said, I am hopeful for the Q Line's future. We need more interconnected public transit options to reduce the need for acres of parking and a disconnected system of private transportation. I'd love to the see the region make a huge commitment to this by supporting the creation and ample of funding of the RTA. People will use transit options that are effective. Let's call these three miles of the Q Line a pilot project and learn some lessons to inform future transit planning. The follow on investments in transit will be better for it. I agree with Bernard H., Gilbert should put his employees on the QLine. The privately owned transportation vehicles, not city buses, that sit on W Grand Blvd and Cass waiting to take employees downtown create more congestion and confusion then necessary. Gilbert's employees should walk a block in a different direction and catch one of Quicken Loans QLine street cars down to their offices. Maybe the timing and efficiency of the QLine would improve if employees were constantly late. 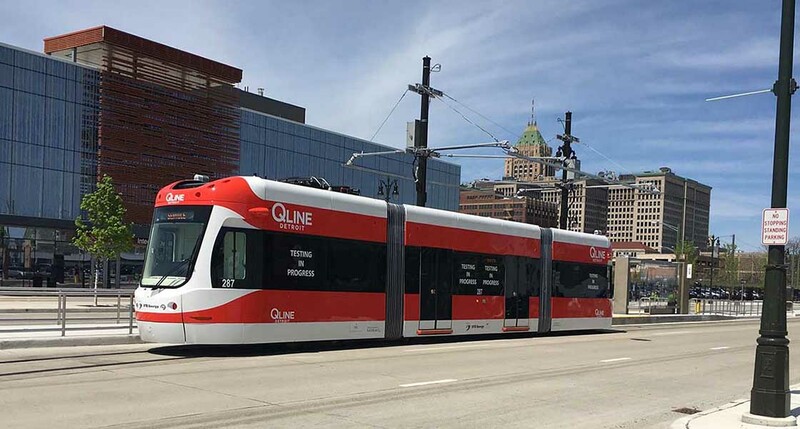 Dan Gilbert and Rock Ventures CEO, Matt Cullen both sit on the board for QLine. Hard to understand why they don't encourage their employees to ride the streetcar they so heavily invested in. sorry for the rant. I agree with Bernhard H. Why aren't Gilbert's employees that park in the Cass garage (Cass\Milwaukee) taking the QLine? Both Gilbert and Rock Ventures CEO Matt Cullen both sit on the QLine board of directors. The privately owned, contracted employee buses that park on around the garage waiting for passengers to take downtown cause congestion and confusion, not to mention the pollution. The employees should walk to a QLine station a block away and ride the QLine their bosses oversee. Makes me wonder why they aren't encouraged by their employer to ride the QLine. I guess the new Detroit sport is to damn the Quicken employees, they were force to move downtown to work for the betterment of Detroit, they should be forced to take the Q for the betterment of Detroit. Anyone so selfish as to live outside of Detroit should be double damned until they are moving to Detroit so they can be blamed for the 'gentrification'. You will get your way because Dan Gilbert cares more about his Detroit image than he does about Quicken employees, so whine a bit more, belittle Gilbert or Quicken a bit more, make it just about the selfish employees and how it is only pennies more [and even through in it would save Quicken a few bucks] and in a matter of months Q will boost their ridership and the employees will be buying heavy coasts and rain gear for that short walk to the Q.
I doubt Quicken employees were "forced" to move downtown to work for the betterment of Detroit. Don't fool yourself. Its a business. Gilbert saw an opportunity to make money and did it. Good for him. This isn't about the selfish employees. It"s about their boss who sponsored a private transportation system, that will go on the public dime in a few years, whose employees don't ride his street car. Would Quicken employees melt in the rain? Gilbert has done a lot for Detroit. But don't forget the big picture. He wouldn't be doing any of this if it wasn't profitable. Perhaps to integrate both the People Mover and Qline with Smart and DDOT, offering a $1 two-hour ticket good only on the QLine and People Mover, or a $2 four-hour ticket good on all four. That may require new fare boxes for the QLine and People Mover, but would be worth it to facilitate easier movement among the different systems. The "Gentrification Express" is the joke of all jokes!! A total waste of federal tax funds!! I love the QLine but wait times are really long. Two weeks ago I had to wait 15 minutes, this seems excessively long. Qline has never discussed being a part of the transfer system. In fact I mentioned it early in the discussions and got disinvited from the following meetings. The 8000 rider goal a day was low so not to even get to 50% is a waste of public money that went into that deal. That line was built to propagate racism in transit not to bolster an economy. Please note: bus riders, like me, know this and have refused to ride it. When a public good is built to exclude the bulk of the people it should serve, it has no choice but to fail. So the total yearly ridership in 2018 was up from the partial year in 2017... How exciting! Ridership is only 50% of projected numbers...I wonder if the same planners and number crunchers were the people saying the bus line that failed to get approved, you know the one they wanted the people where it didn't serve to pay for it, I wonder what those numbers would have been...Would a full 12 month tally have more than an 8 month tally?